Jonathan Rea has won the last four races at Portimao in Portugal. World Superbike title favourite Jonathan Rea says Leon Haslam will be a ‘breath of fresh air’ when the British rider joins him in the factory Kawasaki Racing Team. 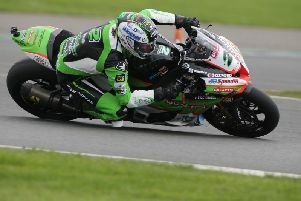 Haslam, who has been the dominant force in the British Superbike Championship this year on the JG Speedfit Kawasaki – chalking up 12 wins ahead the opening Showdown round this weekend at Oulton Park – will replace Tom Sykes in the team for 2019. Leon Haslam will team up with Jonathan Rea at Kawasaki in 2019. Rea has previously raced against Haslam in the British championship and the pair were team-mates at Pata Honda in 2013/14. The Ulster rider says he was pleased by confirmation of Haslam’s deal and feels the Derbyshire man will prove a ‘very competitive team-mate’. He said: “I was really happy to hear that news because Leon has been a great team-mate in the past and also a fierce rival in the British championship. “Also for two or three seasons in SBK we had a close rivalry, so he’s going to be a breath of fresh air inside the team and I’m sure he will fit right into the team. Rea is closing in on a record-equalling fourth world crown as the championship resumes this weekend at Portimao in Portugal after a long summer break, with Rea holding a formidable 92-point lead over Ducati’s Chaz Davies. He has fond memories of the circuit after making his full World Superbike bow at Portimao in 2008. However, Rea had to wait until 2014 to clinch his first victory there, taking the win in race two during his final season on the Pata Honda. Since then, he has won all four WSBK races in Portugal, chalking up doubles in 2015 and 2017 (Portimao was absent from the 2016 calendar). The 31-year-old went into the summer break in red-hot form after notching up two double victories at Laguna Seca and Misano, and Rea has set himself a target of completing a hat-trick this weekend as he eyes another two victories. “I am very excited to go back to Portimao because it is a circuit that I really enjoy,” said Rea, who topped the times in FP1 and FP2 on Friday. “It has been a really long summer break, so the test at Portimao a few weeks ago really helped to whet my appetite to get back. We worked on a range of different chassis items and also some Pirelli tyres, but the real work will start this weekend when we look to get the set-up of the Ninja ZX-10RR dialled in for the circuit conditions and then try to do the best job we can. Over the summer, Rea finished third in the Suzuka 8-Hour endurance race along with Haslam and Kazuma Watanabe for Team Green Kawasaki. He was also reunited with his WSBK Kawasaki for a test at Portimao at the end of last month, where he topped the times. Northern Ireland’s Eugene Laverty will also be aiming to maintain his impressive run of form after the Milwaukee Aprilia rider claimed podium finishes at Laguna Seca and Misano before the summer recess. Laverty, whose prospects were hampered early on the in the season after he was injured in a crash at Buriram in Thailand in March, is currently eighth in the standings with four rounds to go.